_ Microdermabrasion is a gentle skin resurfacing treatment that can rejuvenate and restore the natural glow to the skin, without the need for downtime. 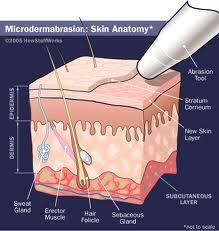 Microdermabrasion is a cosmetic technique that uses a mechanical medium for exfoliation to remove the outermost layer of dead skin cells from the epidermis. Microdermabrasion helps to exfoliate your face, to stimulate cell turnover, improve skin tone, and to soften and polish away mild sun damage and wrinkles.